If there is one willful sin that Victor Correa committed—which he must be making penance for wherever he may be—it was not to have been the principal person accountable for the existence of the world famous Tropicana Cabaret, but to have built it where he did. With its original show of dancers dressed almost like God brought them to this valley of tears, a wide and exquisite selection of drinks and a gambling room open till dawn, ideally, it should have been located far from the madding crowd, hidden somewhere in the outskirts. And that he tried to do, in his own way. Just 20 years away from Tropicana’s first opening, Fidel Castro’s Revolution triumphed in 1959. The young Comandante had been one of the most outstanding students of the Jesuit school. Shortly after, the Jesuits left the school and the country and in 1967, the Revolutionary Government turned the school into the José Martí Technical Military Institute, an engineering school for the armed forces. So, Tropicana is not only the sole open-air cabaret in the world, it is perhaps also the only one that has had to survive, first, being located next to a highly prestigious religious institution and, then, hear bugle calls at reveilles and taps coming from the military academy. If this is not a Guinness record, it sure looks like it. In any case, Martin Fox appeared on the scene in the 1950s. He renewed and gave Tropicana its final defining features in 1952 by hiring the great Rodeiro Neyra, known thereafter as Rodney. Having begun at the cabaret as choreographer, his vision, however, changed the whole concept of the night show, and his spirit is still present in the mix of cabaret and circus, ballet and carnival, modernity and folklore, rhythm and color, and the unique beauty and grace of the dancers that make up the Tropicana show. Politicians, businessmen and celebrities of the arts rubbed shoulders at Tropicana with American mobsters, US marines and Hollywood stars who used to escape to Havana, just for one night, to touch the heavens with their hands. It was around this time that the cabaret was immortalized on film, when in 1958, filmmaker Carol Reed moved its entire staff to Havana to shoot parts of Our Man in Havana, starring Alec Guinness, Maureen O’Hara and Noel Coward. The film is adapted from Graham Greene’s novel. The entrance to the cabaret is through a lush garden where the mythical Fountain of the Muses by Italian sculptor Aldo Gamba stands out. The sculpture and the artist both deserve a closer look. It seems that the sculpture—originally located at the entrance of the National Casino in Cubanacán under another name: The Dance of the Hours— had been born for vice. Indeed, it had been conceived from prison, where Gamba had been sent after shooting his girlfriend and then trying to kill himself. There are other works by the Italian sculptor in Havana, of no less gruesome history, such as the monument to General Máximo Gómez of Cuba’s independence wars at the entrance of the bay. The monument suffered numerous interruptions in its execution requiring the intervention of Benito Mussolini himself for the sculpture to be completed. 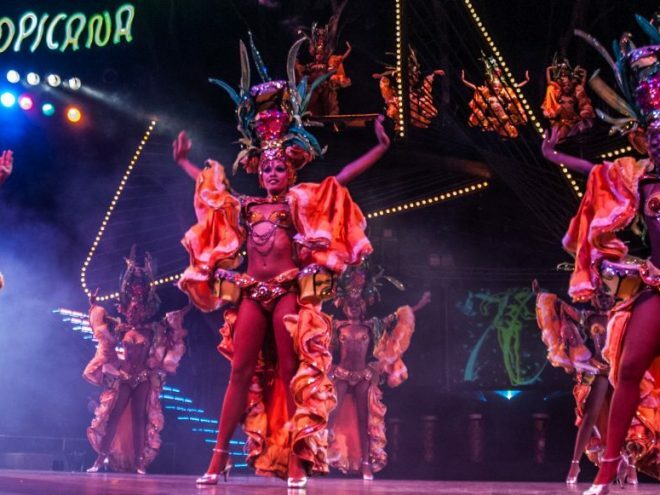 Heavy weight musicians have performed at Tropicana, like Libertad Lamarque, Josephine Baker, Bola de Nieve, Nat King Cole, Rita Montaner, Celia Cruz and Frank Sinatra. No wonder it has always been the most expensive cabaret in the city, with 60 showgirls , 40 models, a dozen singers every night and a live band of 20 plus musicians. The two-hour show, ranges from bolero to danzón, from salsa to Afro-Cuban rhythms, from filin to cha-cha-cha. After the show, you can go the Arcos de Cristal Room for some dancing. Over 150,000 tourists to Havana each year visit Tropicana. As Bertolt Brecht would have said if he had come to Havana: so many yumas can’t be wrong.